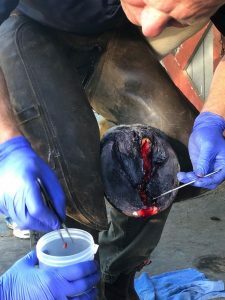 Lameness in a horse is either a primary or a secondary foot health issue. The old adage “no foot, no horse” is oftentimes true and should be critically evaluated. The physical examination is the most important step in understanding the health and balance of the foot. However, subtle changes over time and how the foot responds to pressure can lead to decreased performance. Radiographic examination (x-rays) can help evaluate soft tissues, sole depth, outer surface of the hoof wall, coffin bone angle, joint tilt, and other measurements. Comparing these numbers to normal can be exceptionally beneficial to your horse when we work with your farrier. Cutting edge digital radiography is used to visualize the anatomy of your horse’s feet. Lateral and dorsopalmer views of your horse’s feet will help identify if proper foot balance is achieved and can be used to prevent injury. Your images are then transferred to a USB thumb for your convenience. Either biannual or annual feet films can be valuable in your performance horse. Below you can see some images that show a great example of a negative Palmar Angle. The farrier put on some wedge pads to correct the angel and the is now significantly more comfortable. Canker is a rare condition that can include the frog, bars, and sole of the foot. 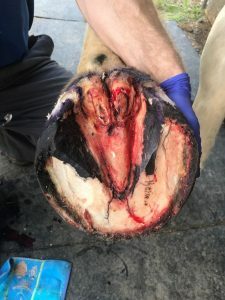 We believe that it is an anaerobic infection of the superficial epithelium of the hoof. Canker will create excessive keratin production which is typically a spongy, white tissue that can easily bleed. Treatment often includes debridement of the affected area, liquid nitrogen freezing, a topical medication, and maintaining a dry environment for the foot. Oftentimes, repeat treatments may be necessary to eliminate the canker.